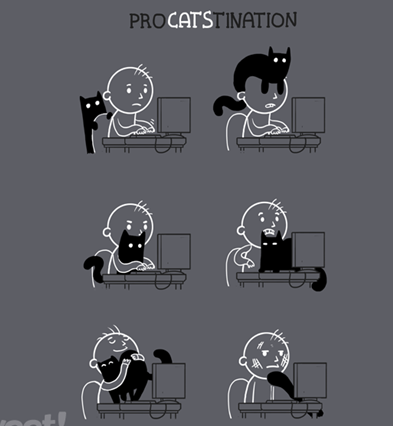 So true, right? Lots of people comment when I wear it! By the way, it's still available over at shirt.woot.com (no affiliation). Why all this T - shirt talk?? Because there's more T - shirt quilts happening in the house! A good friend of mine commissioned me to make six quilts from her late husband's T - shirts, along with tool fabric that he talked her into buying at shop hops. Though I never met him, he must have been a sweet guy! 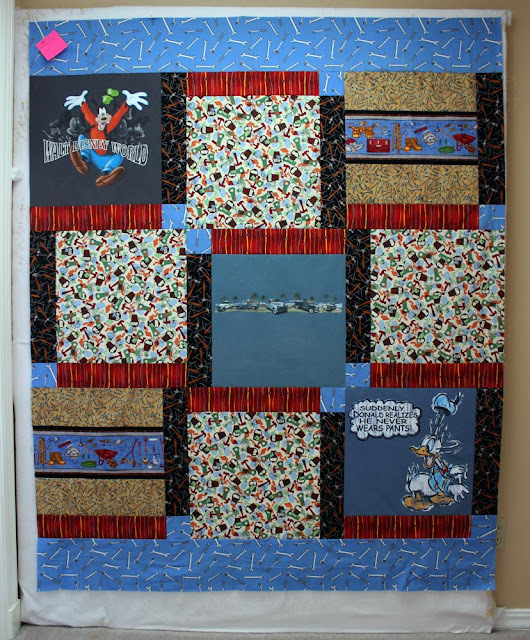 So I have been having a blast playing with really fun fabrics and creating special quilts for her, her daughters, and grandchildren. Two tops are done, measuring approximately 55" x 70". A third one is almost finished, as it just needs sashing and borders. Some quilters don't want to deal with t -shirt quilts but I think they are a lot of fun - endless possibilities! And I've been so inspired by this project that I may finally make one for my hubby (and clear out my closet at the same time!!). I'll keep you posted with my progress. I've never tried a t-shirt quilt but have often admired them. It seems a great way to save memories! 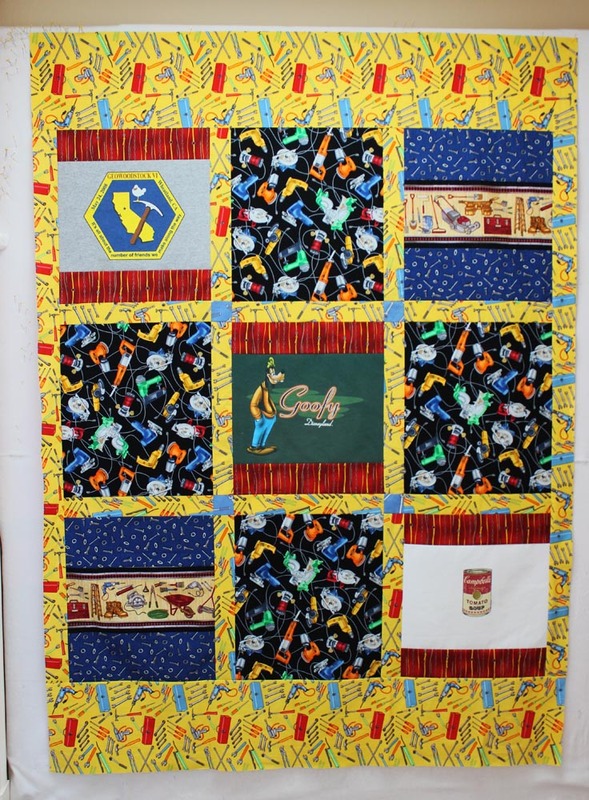 Wow, a series of 6 quilts is an awesome commission; congratulations. Looks like these quilts will help maintain some very light-hearted memories for the recipients with the Goofy and Donald T's! I've only made one t shirt quilt. I made it before I realised the possibilities. I love how yours are turning out. What an amazing way to honor fun t-shirts designs and keep precious memories alive! Thanks for sharing!! Hi Susan, those are great tops. I discovered t-shirt quilts last summer. Except for the very tight deadline, I had a blast. As you said, so many possibilities. And it makes such a great souvenir. So sorry for your friend's loss. His t-shirts are in good hands and I hope the quilts bring her some comfort. Your t-shirt made me smile!